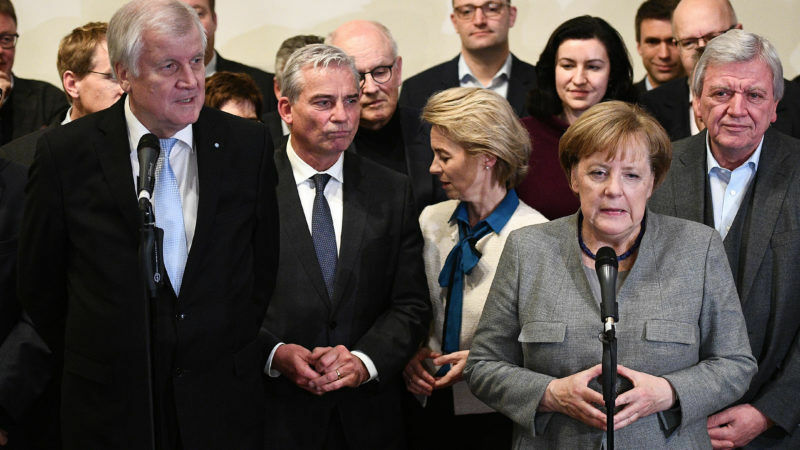 German Chancellor Angela Merkel’s efforts to form a three-way coalition government that would secure her a fourth term hit a major setback on Sunday (19 November) after a would-be coalition partner pulled out of exploratory talks, citing irreconcilable differences. Bavaria state governor and chairman of the German Christian Social Union (CSU) party, Horst Seehofer (L), and German Chancellor Angela Merkel (R) address the media after a final session of exploratory talks of four political parties at the federal state residence of Baden Wuerttemberg in Berlin, Germany, 19 November 2017. The pro-business Free Democrats (FDP) unexpectedly walked out of the talks with Merkel’s conservatives and the Greens, saying that the three parties could not find compromises on key issues like immigration and the environment. Merkel could seek to form a minority government with the Greens, or new elections will be called. Merkel was weakened after an election in September as voters angry with her decision in 2015 to open Germany’s borders to more than a million asylum seekers punished her conservatives by voting for the Alternative for Germany (AfD) far-right party.